Six days after leading the Liberal National Party to a landslide victory Queensland Premier Campbell Newman has revealed his 19-member Cabinet. Mr Newman appointed former LNP leader Lawrence Springborg as Health Minister, with ex-Australian Medical Association head Chris Davis as assistant health minister. Long-term front-bencher Fiona Simpson is to be Queensland’s first woman Speaker. A Liberal Party leader before the parties amalgamated, Dr Bruce Flegg, was appointed Housing and Public Works Minister. David Gibson became Police Minister, while another former leader, John-Paul Langbroek, was given the education portfolio. Mr Newman said Mr Springborg was well-placed to take on the challenging health portfolio. “Health consumes 25 percent of the budget. It needs a minister who will be able to take it forward,” Mr Newman said. The Premier said he didn’t believe he had passed Mr Springborg a poisoned chalice. “Frankly the state of Queensland’s finances, the state of these departments and their performance delivery means that all these jobs are difficult jobs. That’s the sad situation we face,” he said. Mr Newman said departmental restructuring would help rebuild government accountability. 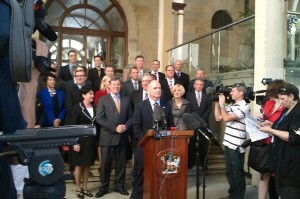 He said the new cabinet would provide strong representation for Queensland. “It’s a diverse lineup. There is strong representation for the regions of Queensland as I promised and this team is going to work very, very hard for Queenslanders,” Mr Newman said. Meanwhile, Opposition Leader Annastacia Palaszczuk said she didn’t believe Mr Newman’s government was representative, particularly of women. “Labor used to have six ministers, female. Now it’s been reduced to three,” Ms Palaszczuk said. The Opposition Leader said while Labor welcomed the appointment of Queensland’s first female Speaker, Ms Simpson should have been appointed to a senior cabinet position. The ministers will be sworn in on Tuesday by the Governor, Penelope Wensley. Jack Dempsey, Minister for Aboriginal & Torres Strait Islander & Multicultural Affairs and assisting the Premier. Robert Cavallucci, Assistant Minister for Multicultural Affairs.